Provides a generic prototype for the analysis of projected innovative developments. Demonstrates the kind of insights that EOA can provide. Highlights the potential advantage of flexibility in size, time, and location of facilities. In particular, it develops the important insight that modular designs may be more profitable than monolithic designs because they enable managers to reduce the significant risk of overdesigned plants, and they increase opportunities by taking advantage of the time and location of increases in demand. Demonstrates the application of EOA to cope with uncertainty in natural processes, in contrast to the more traditional context of market uncertainties. Uses diverse scenarios to identify conditions for which a strategy is valid across significant ranges of future conditions, and contrary situations in which a choice depends on belief about the level of risks. 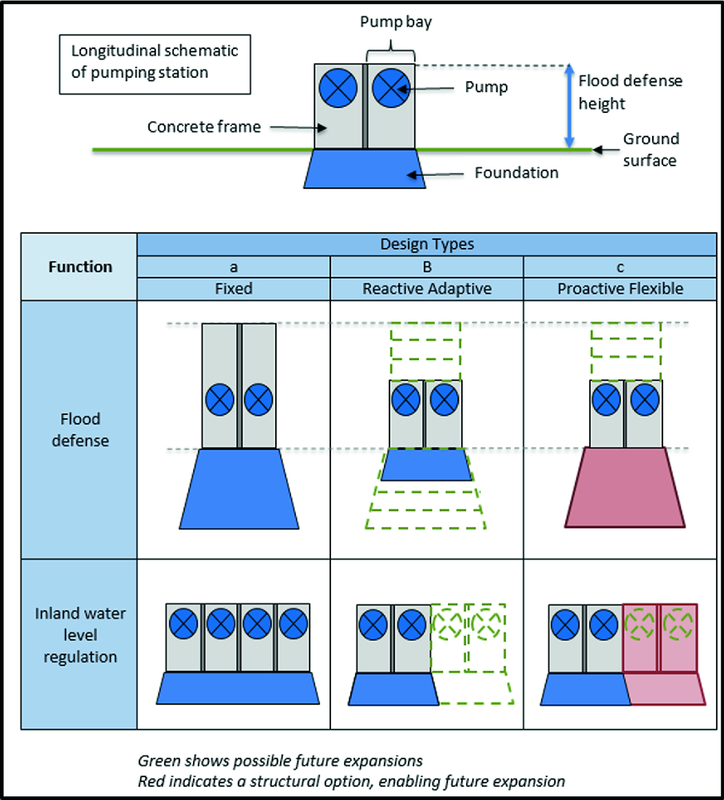 Documents how EOA shows which forms of flexibility in design justify their cost (in this case, flexibility in pumping facilities adds significant value, but flexibility in the flood defense height of the structure does not). Shows how the calculation of distributions of possible outcomes provides decisionmakers with useful information concerning worst-case outcomes, unavailable from average outcomes alone. This case illustrates how Engineering Options Analysis (EOA) can provide effective, useful guidance for the planning of infrastructure developments surrounded by deep uncertainty. By exploring the performance of alternative strategies under a broad range of uncertainties, the analysis can identify which approaches provide the best opportunities for good design. That is, although we cannot conclusively identify which plan is best (given the uncertainty of our data and the future), EOA makes it possible for us to identify preferable strategies, and thus guide decisionmakers and stakeholders toward better solutions. The case study demonstrates this possibility. How does EOA resolve the apparent conflict between its capability to justify desirable strategies and its inability to defend detailed calculations (given the incertitude of the data and the futures the data represent)? This is because EOA views any project as a series of possible actions over time and space. In general, we do not, indeed most often cannot, build projects all at once (de Neufville and Scholtes 2011). We do not develop a power grid or a manufacturing system in one go; we build up such enterprises in various steps over time and in different locations. In this context, planning is about choosing first steps wisely, avoiding locking in a fixed solution. The idea is to select initial steps that give us the flexibility (the continuing opportunity) to make further productive steps as the currently deep uncertainty resolves into increasing certainty about future events. Through the selection of wise first steps, EOA can thus lead us to productive, value-enhancing strategies, even though it cannot specify the value in detail. This case concerns the proposed development of a system to produce Liquid Natural Gas (LNG) as a fuel for road transport by trucks (lorries). The overall concept is to make productive use of this relatively clean resource (compared to diesel fuels rich in particulates) that has generally been wasted (flared off) or otherwise used inefficiently. The idea is to ship gas ashore from deepwater wells, deliver it to a plant for liquefaction, and distribute it subsequently by fuel trucks to distribution points throughout the region. For reference, the proposed project is to be located around Melbourne in Victoria State, Australia. The question is: how should we plan the development of this project? Specifically, what is the most advantageous design of the production facilities? This is clearly a case of decisionmaking under deep uncertainty: Nothing like this has been done in the region, and the market potential over the life of the project is highly uncertain. Not only are the relative prices of the fuels uncertain over the long run of the project, but also the rate at which road transporters will shift from diesel to LNG is totally unknown in this context. This case thus provides a good opportunity to explore the use of EOA in the context of deep uncertainty. The analysis compares the flexible design strategies resulting from the EOA to a traditional engineering design, taken as the base case. This comparison documents the value of EOA analysis. The traditional engineering design came from the Keppel Offshore & Marine company, which also computed the relevant design parameters. It represents the conventional engineering approach, which leads to the “optimal” solution to meet predicted future demand for LNG. Its design process identifies a solution that maximizes value, assuming no uncertainty, treating the future as deterministic. Specifically, it creates a single large facility taking advantage of economies of scale (Fig. 11.1a). In fact, this design does not maximize the actual value of the project, since the realized demand for LNG in 10 or 20 years will differ, possibly substantially, from the predicted values used in the design analysis. Sometimes the plant will be too large compared to the actual use, and will incur great losses as the actual average costs of production using an oversized plant will soar. Sometimes the plant will be too small and miss opportunities. Either way, even though the design derives from an optimization process, the design based on a fixed forecast is unlikely to be optimal for the actual conditions that will prevail. 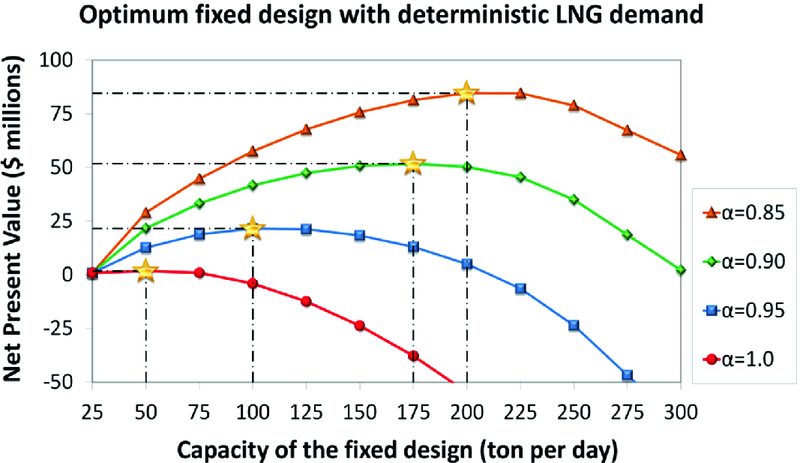 Alternative design configurations of the LNG production and distribution system. Flexible strategy—timing: this strategy deploys capacity at the central site according to how demand does or does not grow over time (Fig. 11.1b). Flexible strategy—timing and location: this strategy allows for gradual deployment of capacity both over time AND geographically at the distribution sites (Fig. 11.1c). The Capex of a LNG plant with a capacity of 25 tons/day is $25 million. The annual operating costs for a LNG plant (Opex) are 5% of its Capex. A management-imposed discount rate of 10%, given the risks and the opportunity cost of capital. A management-defined project lifetime of 20 years; corporate tax rate of 15%; and depreciation as straight-line over 10 years with zero salvage value. Interested readers can find additional details in Ranjbar-Bourani (2015) and Cardin et al. (2015). While these specific cost parameters are treated as fixed inputs in this study, an EOA analysis in general could just as easily treat any of these parameters, specifically including the discount rate, as uncertain variables with associated distributions. The actual future demand for the LNG product of the system is deeply uncertain, due to the fact that future market acceptance of the product, energy costs over the long term, and eventual government subsidies or restrictions, are all unknowable. Despite this obvious reality, the previously completed consultant analyses conventionally assumed a fixed projection for the demand (red line on Fig. 11.2) when they determined the optimal size of the fixed design. The analysis presented here builds on this previous study by working with available market research at the collaborating consultant firm to generate a broad range of possible variants of the base case fixed demand (gray lines on Fig. 11.2). Projected deterministic demand (red) and example projected scenario demands (black). To illustrate the EOA process, this case study applies a distribution over the possible initial demand, the subsequent rate of growth, and the volatility around the projected deterministic trend. The choice of which distribution to use, while also a deeply uncertain assumption, should be made based on available data quantifying parameter uncertainty, where available. In our case we apply a uniform distribution over the range as a matter of simplicity and to illustrate the process, without advocating it as a preferred choice. Using Monte Carlo simulations, we develop thousands of possible demand paths over the projected life of the project. Figure 11.2 illustrates some possibilities compared to the deterministic assumption. As we should expect for long-term forecasts for new technologies in new markets, the possibilities deviate substantially from the best deterministic estimate (de Neufville and Scholtes 2011). While this characterization of uncertainty remains imperfect, the point here is simply to point us toward more productive first steps, NOT to give us a perfectly rationalized, complete plan for the future. There is also deep uncertainty about the system itself. Although we know that petrochemical plants routinely exhibit substantial economies of scale, we do not know what these will actually be for the proposed system, when developed in a new context. The analysis reflects this deep uncertainty by examining several possibilities for the economies of scale factor α: 1, 0.95, 0.9, and 0.85. To our knowledge, these values represent the range of possibilities for such plants. To account for uncertainty in the learning rate for the modular design, the analysis examines learning rates corresponding to LR = 0, 5, 10, 15, and 20%. Note in this context that the learning phenomenon encourages the use of modular flexibility. It counterbalances the effect of economies of scale, which is to promote large early investments in infrastructure. The learning effect reduces the cost of small modular increments of capacity compared to large units. In this respect, the learning phenomenon is comparable to the time value of money: they both encourage smaller investments tailored to more immediate demands. 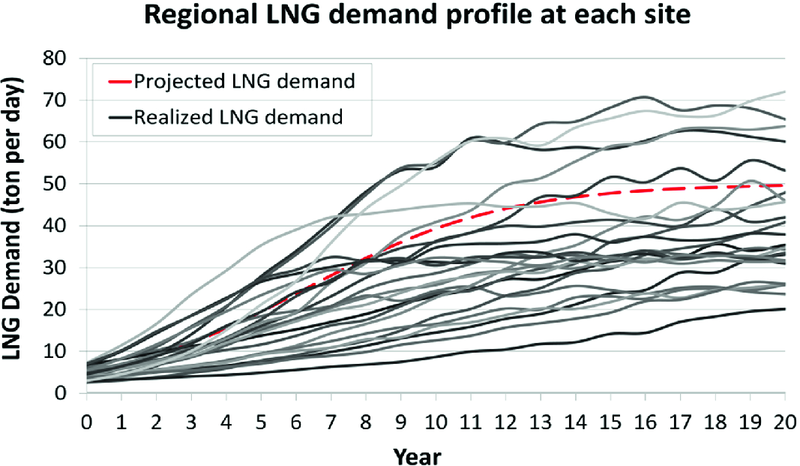 The conventional engineering analysis (based on a previous consultant’s study) calculated the optimal size of the central plant for a fixed forecast of the LNG demand. How could the designers do this one might well ask, given the many uncertainties? Different engineering practices invoke a variety of sources, such as industry forecasts provided by economists, midpoint estimates from geologists, etc. The point here is that designing around specific forecasts is common practice, and this is what the consultants for the fixed design did. The optimum in their case was the maximum net present value (NPV); i.e., the solution that provided the greatest discounted benefits over discounted costs. There is a design “sweet spot” for the optimal, most profitable, plant size (the stars on the curves) for any level of economies of scale: build too small, and the design loses out on potential profit from higher demands; build too large, and there is overcapacity and attendant lower values. The greater the economies of scale (smaller α), the larger the optimal fixed design should be. This is because the economies of scale lower the average unit cost of capacity, and thus favor larger designs. Given the assumed existence of aggressive economies of scale for petrochemical plants, the previous consultant’s fixed design process produced a plan to build a single large plant of 200 tons/day (i.e. corresponding to α = 0.85). As Fig. 11.3 indicates, this plan seemed highly profitable, delivering a NPV of about $84.56 million, a substantial return over the cost of capital indicated by the 10% discount rate. Before proceeding further, we should explicitly note that—in the realistically uncertain world—the results from a deterministic analysis can be systematically incorrect and misleading. This phenomenon is particularly true for capacity-constrained systems, such as plants with limiting capacities. Such facilities do not benefit from excess demand over their capacity, but do lose when the demand is less than anticipated. For cases where the uncertain demands are equally likely to exceed or be less than expected, the uncertainty systematically leads to lower overall value. Gains are limited and unlikely to counterbalance losses. In general, we must expect that the average overall result of an uncertain environment is not equal to the result associated with the average of the uncertain environment. This is the common fact known as Jensen’s Law. To assume incorrectly that system value calculated using average parameters is the true expected value is to fall victim to the “Flaw of Averages” (de Neufville and Scholtes 2011). The true expected value may easily differ greatly, as Table 11.1 indicates. 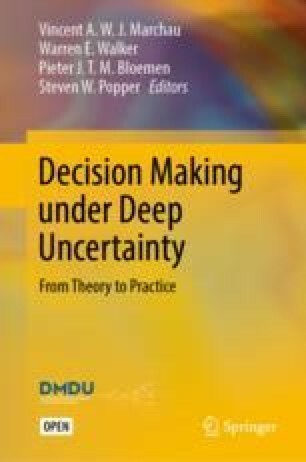 The expected performance of the fixed design in the context of uncertainty analysis differs systematically and significantly from that of the deterministic analysis. Our analyses demonstrate the phenomenon by calculating and comparing the performance of the most profitable fixed design under conditions of deterministic and uncertain demand. Specifically, we use Monte Carlo simulations to subject the optimal plant size to 2000 different futures, comparable to those in Fig. 11.2. The value of the design under uncertainty is then a distribution associated with the possible demand realizations. Because of the non-linearities within the system, inherent in both its cost structure and the variations in demand, the shape of the distribution of values differs from the distribution of demand. Focusing on the plant design set forth by the consultant (200 tons/day for an economies of scale factor α = 0.85), the deterministic analysis estimates its net present value (NPV) at $84.56 million. By contrast, the simulation analysis calculates the expected net present value (ENPV) of this same plant design to be only $61.18 million, 20% less when we take uncertainty into account. This discrepancy between the values resulting from the deterministic and uncertainty analyses is across the board for all of the optimal plant sizes associated with different levels of economies of scale. Results obtained from a deterministic analysis systematically fail to recognize the value under uncertainty. Table 11.1 presents the comparisons. Moreover, analyses recognizing uncertainty lead to systematically different optimal designs than the deterministic analysis. In this example, the most profitable fixed designs for the uncertain demand are all systematically smaller than those suggested by the deterministic analysis. For example, with the greatest economy of scale factor (α = 0.85), the most profitable design is 200 tons/days when ignoring uncertainty, but 175 tons/day from our analysis with uncertainty. This is due to the lower project values that occur once the analysis accounts for uncertainty. The essence of the flexible strategies in the LNG case is to deploy capacity in modules according to proven (realized) demand. The idea is to build less capacity at the start to avoid premature over commitment and overcapacity, and to add capacity modules according to realized demand. In this case, field experts indicated that available standard modules have a capacity of 25 tons/day. The operational question is: when should we make use of the flexibility to expand? Given the uncertainty in the evolution of demand, there is no a priori absolute answer to this question. In practice, we want to expand capacity when demand has grown sufficiently. Thus the operational issue for the analysis is to determine, for each possible realization of the future, when the growth meets the criterion to justify extra capacity. The values that trigger action in the decision rules are the threshold values. A flexible strategy that enables capacity expansion at the main production site when actual demand justifies this investment. It displays the cumulative distribution of the performance of each design (that is, the target curves). A few words explaining cumulative target curves. The lower left side of each target curve indicates the lowest level of performance of each design as observed in the simulation, which is at 0% on the vertical scale of the cumulative distribution. The curve extends to the upper right, where it indicates the maximum performance observed, at the 100% level of the cumulative distribution. As an illustrative example, the curve for the fixed design in Fig. 11.4 could lead to an NPV as low as minus $25 million, with a maximum of a nearly plus $21 million. Overall, the ENPV of this fixed design is $14.27 million. Cannot gain more than an NPV = $21M, since it cannot serve demands exceeding its fixed capacity. 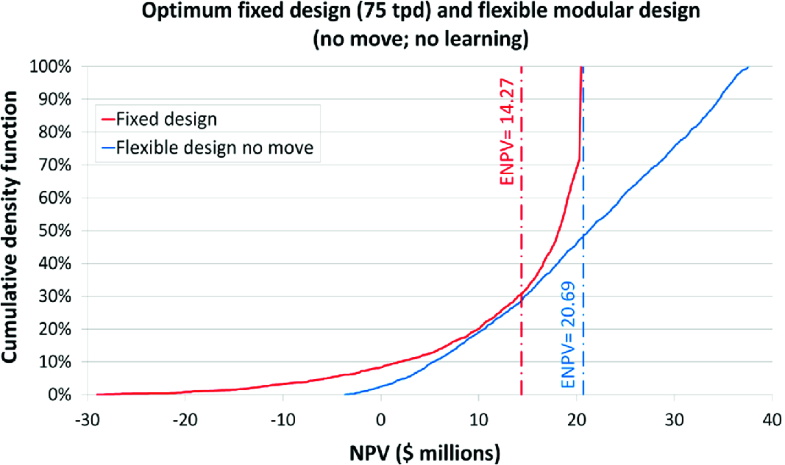 Its ENPV = $20.69M, nearly 44% better than the fixed design ($20.69M vs. $14.27M)! Its overall performance in this case stochastically dominates that of the fixed design (that is, its target curve is absolutely to the right of, and thus better than that of the fixed design). It reduces exposure to downside risks: the decision to start small puts less investment at risk and lowers maximum losses if demand is low. 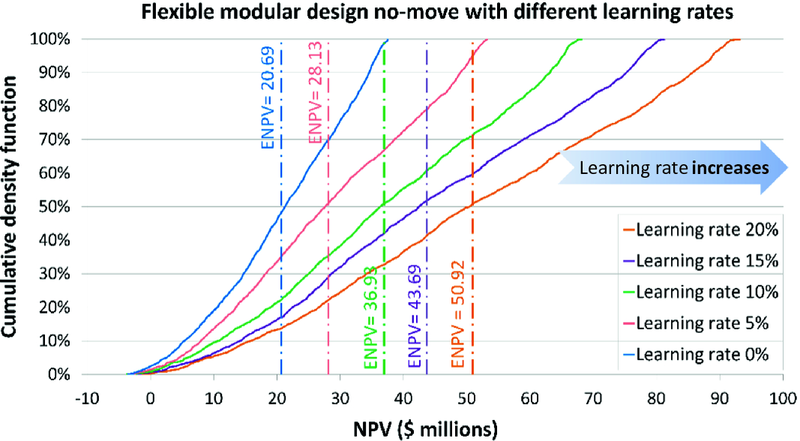 In this particular example, the flexible design strategy reduces maximum NPV loss from about−$25M to less than−$5M. Conversely, it provides the ability to take advantage of upside opportunities: it enables the easy addition of capacity when demand soars, and increases the maximum NPV gain from about $21M to nearly $38M. In this case, the flexible strategy systematically leads to more valuable results in all respects. The flexibility analysis for the strategy that allows flexibility both as to when and where to add capacity is similar to the previous analysis. However, this analysis uses additional decision rules to explore the locational flexibility. These decision rules address three questions: When should we build the modular plant for the first time? When should we expand it? And where should we build it? Essentially, the decision rules result in capacity expansions being undertaken in those areas where observed demand is the greatest. Figure 11.5 shows the additional advantages of the flexibility to locate capacity away from the main site. 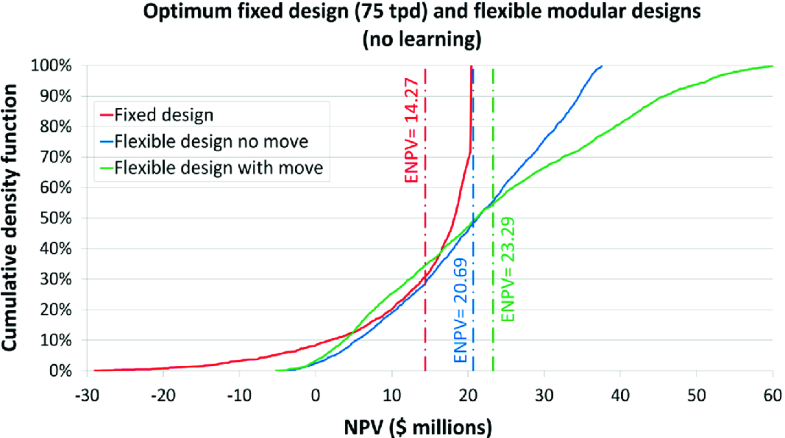 As expected, looser constraints on system design increase the maximum potential value. In this case, the ability to distribute capacity across the region (and thus to reduce logistic costs) further increases the system ENPV (from $20.69M to $23.29M) and the maximum NPV (from about $38M to about $60M). However, in this case, the strategy with locational flexibility does not stochastically dominate alternative designs. Visually, its target curve crosses the target curves of the alternative designs. In this and similar cases, designers may not want to choose the solution based upon a single metric such as ENPV. Indeed, no single metric is sufficient to characterize a general distribution. In this context, we need to consider multiple criteria of evaluation. Table 11.2 provides a multi-criteria display of the performance of the preceding fixed design and the two flexible strategies. It displays the average ENPV and two measures of the extreme values. The best results for any criterion are bold-faced. In terms of extremes, better practice generally focuses on some threshold level of cumulative performance rather than on the absolute maxima and minima values from the Monte Carlo simulation. This is because those highest and lowest values, being very rare, can vary considerably among simulations. The threshold measures are quite stable, however. Standard thresholds of interest are the 10% Value at Risk (the performance at the 10% cumulative probability or percentile), and the 90% Value at Gain. Table 11.2 compares the performance of the fixed and two flexible designs in these terms. In this case, the flexible strategy involving both time and location might seem better, even though it does not dominate the flexible strategy that only considers the timing of additions. Specifically, the more inclusive flexible strategy offers the highest expected NPV—less downside risk than the fixed design, and greater upside potential. Learning increases the value of flexibility. Because it reduces the cost of modules as more get implemented, it favors their use and thus increases the value of flexibility. Figure 11.6 shows how this occurs. It compares the target curves for the flexible strategy—timing at various levels of learning—from none (LR = 0%) to 20%. The message is clear: the greater the rate of learning, the more valuable the flexibility using modules. As expected, lower economies of scale and greater learning rates increase the value of flexibility. The value of flexibility in this case ranges up to $60 million. Flexibility thus offers significant potential, which demands exploration. In this case, the flexible strategies are valuable for all but the most extreme cases (that is, cases where the economies of scale are particularly high and there is no learning). 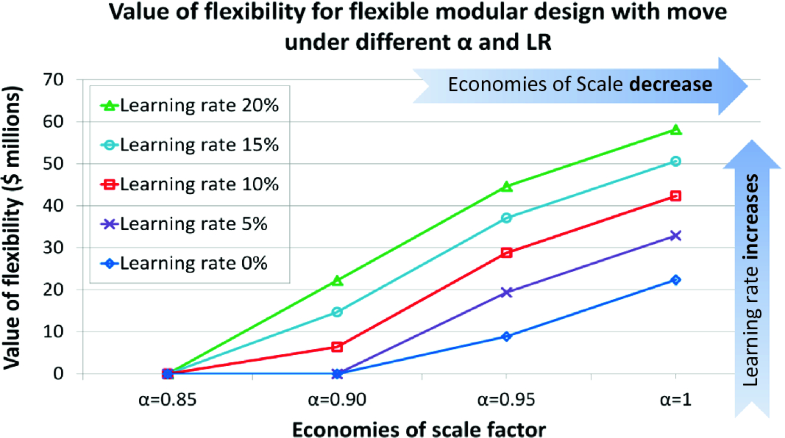 For even modest learning rates and economies of scale, the flexible modular design is valuable overall. One may thus conclude that, in this case, the modular flexible strategies fare well over a wide range of variations in these parameters. In general terms, the result is that, even faced with deep overall uncertainty for this system, we can conclude that a flexible strategy is ultimately desirable. EOA generates a large amount of relevant data. It offers many metrics for comparison of the alternatives. This is a great advantage over economic options analysis (which generates a single price or value for the options), or an optimization process (which uses a single objective function). EOA’s range of metrics enables decision makers to compare alternative strategies from several perspectives simultaneously. The initial Capital Expenditure (Capex) of projects, to which many investors pay great attention when there is substantial risk. As often happens, different projects appear best according to different criteria. The fixed design has the lowest standard deviation, and thus might be labeled most “stable.” This could be considered a good thing, but here this merely indicates that the fixed design performs uniformly poorly, as it cannot take advantage of upside opportunities. Overall, the flexible strategies appear to provide the most balanced overall solutions. Its overall performance is inferior, as it has considerable downside risk with little upside opportunities (Figs. 11.4 and 11.5, Table 11.2). Its average performance is superior only in the extreme cases, in which there are the most favorable economies of scale and no learning (Fig. 11.7). Average performance, which is generally far superior to the fixed strategy (Tables 11.2 and 11.3). Start the project with a small module, leaving open the question of whether to later adopt a strategy that accepts the possibility of locational flexibility in addition to timing flexibility. Overall, commit to a policy inherent in flexible design: monitoring, incremental learning, and adaptive management as the future reveals itself. This second case complements the first, providing insights about the use of EOA in the planning and design of water management infrastructure. The focus is less on economic profit and more on continued reliability of service. This case explores the application of EOA to water management infrastructure, using the example of a pumping station on the North Sea Canal. The North Sea Canal is an important shipping and drainage channel in the Netherlands (Fig. 11.8). 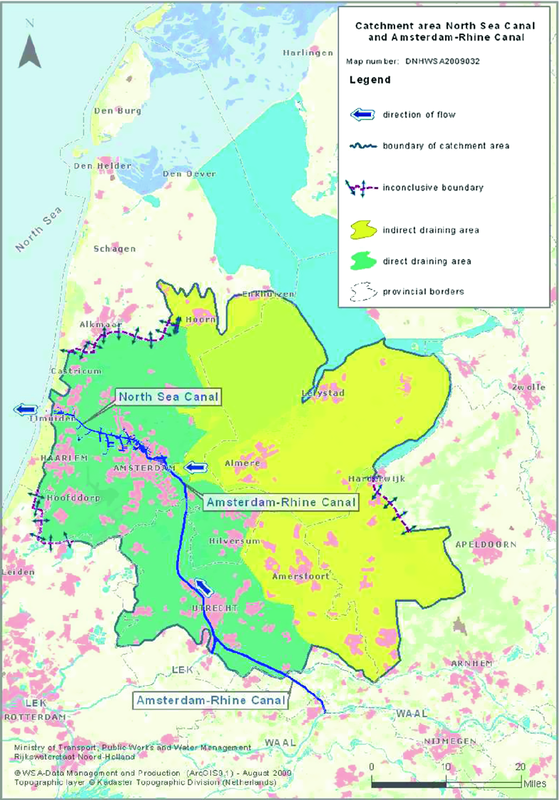 It connects inland waterways to the port of Amsterdam, and to international markets beyond. Construction of the canal necessitated piercing through a series of coastal sand dunes that historically offered flood protection to inland areas against high waters on the North Sea. At this interface between the canal and sea, known as IJmuiden, the Rijkswaterstaat (the agency responsible for the design, construction, management, and maintenance of main infrastructure facilities in the Netherlands) constructed a set of hydraulic structures, including shipping locks, discharge sluices, and a pumping station. Flood defense, serving as a barrier between the North Sea and inland areas, reducing the risk of flooding from high water on the North Sea. Regulation of inland water levels, discharging inland precipitation runoff to the North Sea. Water quality management, separating the saline water of the North Sea from the fresher water in the canal. Ecological management, facilitating the passage of fish. This case study focuses only on IJmuiden’s primary functions—the structure’s role in flood defense against the North Sea and as a regulator of inland water levels. The ability of the structure to continue to fulfill these functions in the future depends on a variety of external factors, such as sea levels on the North Sea, and the impacts of precipitation and regional socio-economic development on canal runoff. Clearly, there is substantial uncertainty about future values of these key parameters, which complicates the question of planning and designing a replacement for the pumping station. The overall question is: given uncertainty about the future, how do different plans for structural replacement (each offering equivalent reliability of service) compare in terms of lifecycle costs? Which replacement strategy is a wise first step because it offers the ability to maintain service reliability as future uncertainty resolves itself? This section characterizes the sources of uncertainty most relevant for long-term replacement planning for IJmuiden. Colleagues within the VONK project used expert consultation to determine the sources of uncertainty with the largest potential impact on the long-term functionality of the pumping station. As Table 11.4 indicates, the sources of uncertainty are station-function specific. We can classify uncertainty into different levels, ranging from situations where there is uncertainty among well-defined alternatives with known likelihoods of occurrence, to those where neither the range of possible outcomes nor the associated probabilities are well characterized. For instance, while we can adequately describe day-to-day precipitation variability using stochastic variables informed by historic precipitation records, we can forecast long-term climate changes in extreme precipitation much less clearly. Level 2 uncertainties that we can model probabilistically with some confidence. The analysis models these using stochastic variables. Level 3 and Level 4 uncertainties2 that we handle using a range of scenarios. Uncertainty in the precipitation-canal inflow relationship. This approach—capturing deep uncertainty and “probabilistic uncertainty” by coupling scenarios with stochastic variables—is a pragmatic way of coping with different relevant types of uncertainty. Others have used it in the literature on water resources planning, for example Jeuland and Whittington (2013, 2014). This case investigates several proposed replacement designs for the IJmuiden pumping station under the uncertain conditions described above. Table 1.6 schematically displays these design alternatives. Each of them maintains the same minimum function-specific level of service throughout the entire planning horizon. For flood defense, Dutch federal law (Netherlands Flood Defense Act 2009) mandates the protection level any structure should provide; IJmuiden should protect against North Sea levels exceeded on average once every 10,000 years. For the regulation of inland water level, this study used service levels consistent with the 2013 North Sea Canal Water Accord (Beuse 2013). Fixed design, consistent with the traditional predict-then-act approach to water resource planning. The structure provides at least the minimum level of service through to the end of its design life, with a safety margin added to buffer against any uncertainties that may not be captured in the analysis. It embodies the traditional engineering mindset, emphasizing over-dimensioning and taking advantage of any economies of scale (Table 11.6, Column a). Reactive Adaptive design, which acknowledges that a fixed structure may represent an over-investment and hence emphasizes designing for the best-available current information and making changes as needed as the future unfolds (Table 11.6, Column b). Designers size reactive adaptive designs for the short-term, but make no explicit preparations to facilitate possible future adaptations. Proactive Flexible design, which goes a step further than the reactive adaptive design in that it prepares for the future by choosing to include options within the initial structure (Table 11.6, Column c). Designers size flexible designs for the short term, but proactively incorporate options that enable easy adaptation in the future. A height able to withstand the best-estimate flood heights over a 25-year planning horizon. This relatively short planning horizon acknowledges the need to revisit this decision in the coming decades, but does not make any explicit preparations for possible later expansion. If a height expansion becomes necessary in the future, it will come at a considerable cost, because resizing of the structure’s foundation will be necessary. A pumping capacity able to discharge the best-estimate canal inflow volumes over a 25-year planning horizon. If the addition of further pumping capacity becomes necessary over the structure’s lifetime, a new “mini” pumping station will need to be installed adjacent to the current structure. The option to expand the flood defense function includes a larger-than-currently necessary foundation for the structure; this facilitates future height additions as needed. The option to expand the function to regulate the level of inland water includes additional pump bays in the concrete frame; these enable easy installation of additional pumps if/when necessary. Steel gates seal off these additional bays until the time managers install additional pumps. Within this case, the factor that drives necessary modifications to the structure is the need to provide a continued level of service in spite of evolving external operating conditions. This contrasts with the LNG case presented earlier, in which the production and distribution system grew in response to changes in consumer demand. In both cases, appropriate decision rules signal when managers should initiate a change in the system. In the case of the pumping station, capacity is expanded whenever the required service level can no longer be maintained. The core of the quantitative analysis couples a physical and an economic module (Fig. 11.9). Physical performance module links changes in future operating conditions (such as higher sea level) to performance indicators of interest (such as water levels associated with specified return periods at a certain location). It generates many simulations of future environmental conditions, consistent with the different sea level rise and precipitation change scenarios (Table 11.5). 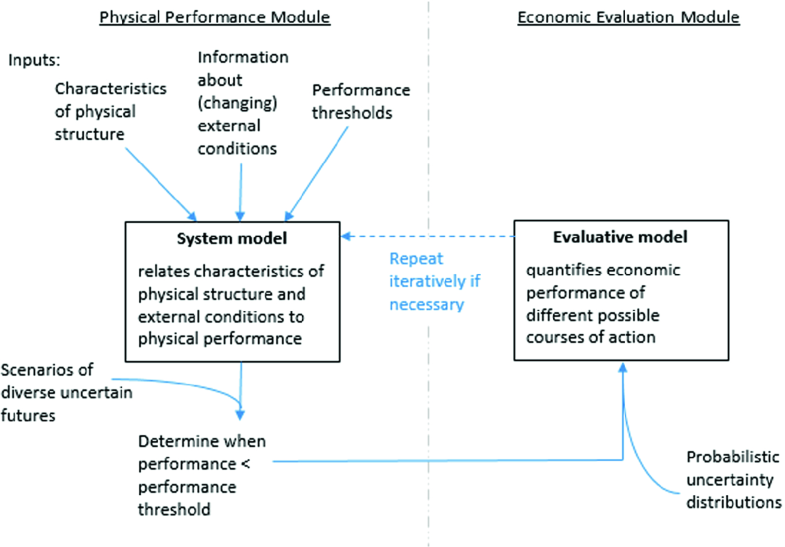 This module both indicates under what future conditions the current physical system becomes inadequate, and captures how different possible courses of action affect the future performance of the system. There is a different module for each of the two functions the case examined. Economic evaluation module uses the simulations of the physical system as input to compare different courses of action based on whichever performance indicator(s) the analyst considers most suitable. This case study analyzed lifecycle costs of the different structural designs (Table 11.6). It compared the alternatives based on total cost of ownership, including possible later expansion costs in addition to initial capital costs. All analyses applied a discount rate of 5.5%, consistent with a 2.5% risk-free rate and a 3% risk premium, which the Rijkswaterstaat uses for capital investment projects. However, the case study also generated results for a range of other discount rates for the purpose of sensitivity analysis. The lifecycle cost analysis used Monte Carlo simulation to evaluate 1000 different versions of the future for each of the different scenarios. The analysis ultimately generates distributions of lifecycle costs, for each function in turn. These compare the performance of different designs, over many possible simulated futures. We present and discuss selected results below (to see a complete set of results, see Smet 2017). Proactive Flexible, which creates a pumping station with the maximum number of pump bays that might be needed, but defers purchasing and installing the pumps until actually necessitated by external developments, and thus saves on immediate costs. Figure 11.10 shows the relative lifetime economic performance of these three different structural designs, for the two most extreme scenarios from Table 1.5, using discount rates of 0 and 5.5%. In this case, both the Reactive Adaptive and Proactive Flexible designs always perform better than the Fixed design, across all scenarios and discount rates. The results for other scenarios and discount rates (not shown) are not appreciably different from those in Fig. 11.10. This demonstrates that, for the water level management function, Reactive Adaptive and Proactive Flexible designs can offer substantial gains compared to the traditional Fixed approach. Which of the two is better? When there is no discounting of future costs (0% discount rate), the Proactive Flexible design generally outperforms the Reactive Adaptive design. In the riskier scenario (High Sea Level/Extreme Precipitation), the Proactive Flexible design dominates stochastically over the Reactive Adaptive design in delivering lower costs. In the less risky scenario (Low Sea Level/Low Precipitation), the Proactive Flexible design delivers lower costs on average and more reliably. In this case, the Proactive Flexible design leads to higher costs than the Reactive Adaptive design in about 15% of simulations, but still costs less about 25% of the time. Comparing both of the above scenarios, the Proactive Flexible solution is more valuable in the riskier scenario. The intuition here is that the greater the number of expansions required over the course of the project horizon, the better the Proactive Flexible design, which enables relatively cheap expansions. In this it contrasts with the Reactive Adaptive design, which implicitly gambles on few, if any, expansions becoming necessary. This observation is consistent with our knowledge that the value of options grows as the degree of uncertainty about the future increases. When future costs are discounted over the long-project horizon, this reduces the advantage of the Proactive Flexible design. 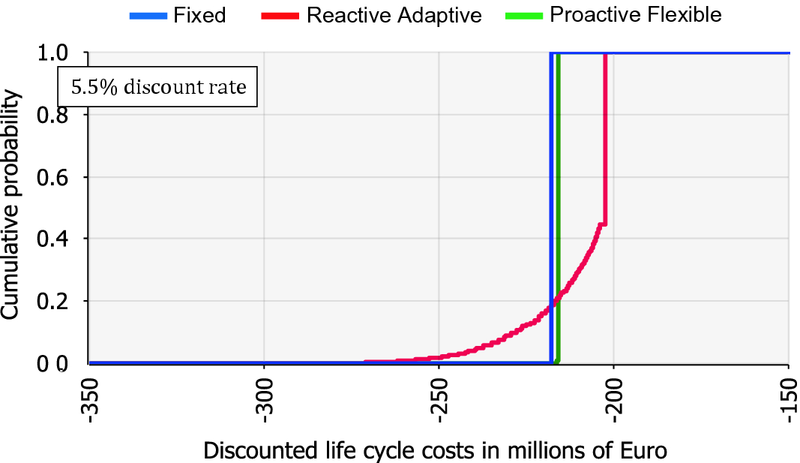 In our case, the discount rate of 5.5% erases the disadvantage of expensive future adaptations, making the Reactive Adaptive design the dominant solution. Finally, notice the consequence of using simulation in the EOA analysis: all results in Fig. 11.10 are in the form of distributions of outcomes. As in the LNG case, this is a major advantage of EOA over standard Real Options Analysis, which produces “value” as a singular measure of performance. By looking at entire distributions, we are able to gain insights about the specific conditions under which one design outperforms another. With results in this form, decisionmakers are able to balance different trade-offs, such as worst case versus average performance, as we did when discussing the relative merits of the Reactive Adaptive and Proactive Flexible designs in the undiscounted Low Sea Level/Low Precipitation Scenario. So the preferred choice between Reactive Adaptive and Proactive Flexible designs depends on the decisionmakers’ belief about the future and their willingness to bear high-cost worst-case outcomes. Proactive Flexible, which creates the foundation on which to build the maximum flood defense height that might be needed, but defers raising the height until actually necessitated by external developments, and thus saves on immediate costs. 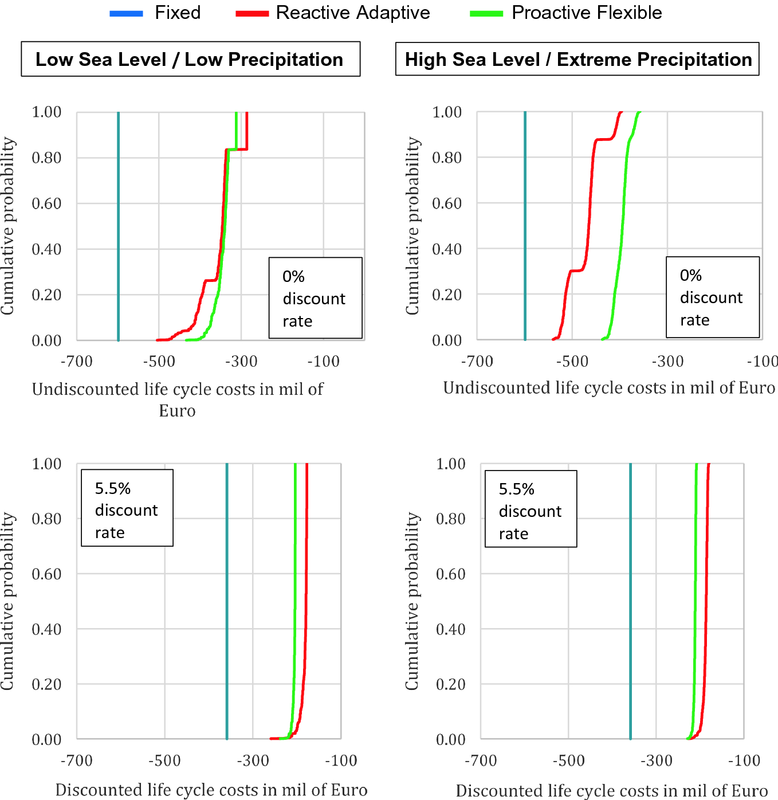 Figure 11.11 shows the relative lifetime economic performance of the three alternatives, using the standard 5.5% discount rate for the high sea level rise scenario. In this case, the dimensions of the foundation and other below ground structural components are central determinants of the capital cost. As the Fixed and Proactive flexible designs both provide for the same eventual height, they both require the same foundations. The Proactive Flexible solution is cheaper, because it defers or avoids an increment of height. The Reactive Adaptive design commits initially to lower height, and thus a smaller foundation. It is therefore markedly cheaper to build initially, but may lead to substantial eventual costs sometime in the future, when an upgrade in height, and thus reconfiguring of the foundation, may become necessary. Viewed in terms of present value, however, the discount rate greatly reduces these distant extra costs. So the preferred policy might be to adopt the Fixed design, and be done with it. Reject the Fixed design, which sees all the pumping capacity that might eventually be needed installed at the outset. Choose one of the two incremental strategies, either the Reactive Adaptive design or the Proactive Flexible design. The Reactive Adaptive design is the preferred design for decisionmakers more willing to accept higher long-term costs in exchange for short-term savings by building a smaller structure. The Proactive Flexible design is the preferred design for decisionmakers who anticipate and want to be prepared for large degrees of environmental change in the future. Reject the Reactive Adaptive design because the short-term cost savings from choosing a smaller structure do not outweigh the future risks. The Fixed and Proactive Flexible designs demonstrate comparable lifetime economic performance. Thus, all else being equal, the preferred policy may be to simply adopt the traditional Fixed design. Overall, this case explored replacement of a complex structure that fulfills a number of different functions. For IJmuiden, the EOA analysis shows great added value from incorporating an option in the design of the pumping facilities, fulfilling the inland water regulation function. Conversely, in this case, the value of flexibility in the flood defense height of the structure does not substantially improve the lifetime cost performance, as compared to a traditional fixed design. As an approach, EOA offers the tools to structure an analysis of such complex, multi-functional systems, providing insights into which functionalities could benefit from a proactive and flexible approach and which conditions maximize these benefits. EOA does not prescribe a single plan. The focus is on how to start on a path that leads to a line of possible desirable developments while avoiding threatening downside risks. EOA does this in the same way a chess master does not commit to the details of a strategy from the start, but begins with a single move, such as Pawn to King 4. Chess masters will choose the details of subsequent strategy as they learn about the intentions of their opponents, as their deep uncertainty gives way to more knowledge and understanding. Likewise, the project planners for the LNG plant can defer the details of their strategy until they learn more about the market for the product, the government intentions, energy prices, and the economies of scale and learning rates of the technology. So too, the project managers of IJmuiden can monitor changes in precipitation and sea level before taking appropriate next steps in their long-term investment plan. EOA can cope with diverse and deep uncertainties: The two cases presented here applied EOA to planning problems in which there were a diversity of sources of deep uncertainty, ranging from future technological innovation, demand for LNG, sea level rise, and changes in precipitation. Taken together, these cases indicate that EOA can provide valuable insights for the decision process, when faced with immense uncertainty and in the absence of reliable probabilistic information. In contrast to traditional Options Analysis, EOA produces distributions of results, which provide valuable additional insights: These two cases produced results in the form of distributions, and demonstrate how the calculation of distributions of possible outcomes provides decisionmakers with useful information concerning worst-case outcomes, unavailable from average outcomes alone. Results in this form explicitly inform decisionmakers about the tradeoffs among objectives, helping them to identify preferred strategies. EOA is a versatile and rigorous analytical method: The core EOA method can be adapted for many different types of problems and purposes. The LNG case study emphasized the role of infrastructure size, economies of scale and learning rates on the development of a sound investment plan, while the IJmuiden case highlighted how a reactive versus proactive approach to investment can result in substantially different outcomes. The basic method lends itself to diverse modifications and additions. Note: “Threshold values” in EOA serve a similar function to that of the “triggers” or “Adaptation Tipping Points” used in other DMDU approaches. Climate change is commonly mentioned as a source of deep uncertainty. The question of assigning probabilities to future scenarios of climate change is particularly controversial. While many argue that scientific uncertainty about emissions simply does not allow us to derive reliable probability distributions for future climate states, others counter by saying that the lack of assigned probabilities gives non-experts free rein to assign their own, less well-informed probability estimates. Grubler and Nakicenovic (2001), Pittock et al. (2001), Schneider (2001), Dessai and Hulme (2007), and Morgan and Keith (2008) present some of the arguments for and against assigning probabilities to climate scenarios. Beuse, P. H. (2013). Waterakkoord voor het Noordzeekanaal en Amsterdam-Rijnkanaal 2013. Rijkswaterstaat West-Nederland Noord. [online] Available at http://www.infomil.nl/publish/pages/72267/waterakkoordnoordzeekanaal-amsterdam_rijnkanaal_2013.pdf. Accessed September 15, 2017. Cardin, M.-A, Ranjbar-Bourani, M., & de Neufville, R. (2015) Improving the lifecycle performance of engineering projects with flexible strategies: Example of on-shore lng production design. Systems Engineering, 18(3), 253–268. http://doi.org/10.1002/sys.21301. Ranjbar-Bourani, M. (2015). An integrated multi-criteria screening framework to analyze flexibility in engineering systems design: Applications in LNG infrastructures. Ph.D. dissertation, Department of Industrial and Systems Engineering, National University of Singapore. http://pqdtopen.proquest.com/doc/1761163141.html?FMT=AI. Royal Netherlands Meteorological Institute (KNMI). (2014). KNMI’14: climate scenarios for the 21st century—A Netherlands perspective (B. van den Hurk, P. Siegmund, & A. Klein Tank (Eds.)). Retrieved September 10, 2017, from http://bibliotheek.knmi.nl/knmipubWR/WR2014-01.pdf.